Figure 1. H.E. Ambassador Philippe J. Lhuillier delivers his remarks, highlighting key achievements in the 70 years of PH-Spain relations. Figure 2. (L) Secretary General of Instituto Cervantes, Rafael Rodriguez-Ponga Salamanca welcomed guests to the event; (R) Rep. Benhur Salimbangon also spoke on PH and Spain’s special relationship. Figure 3. 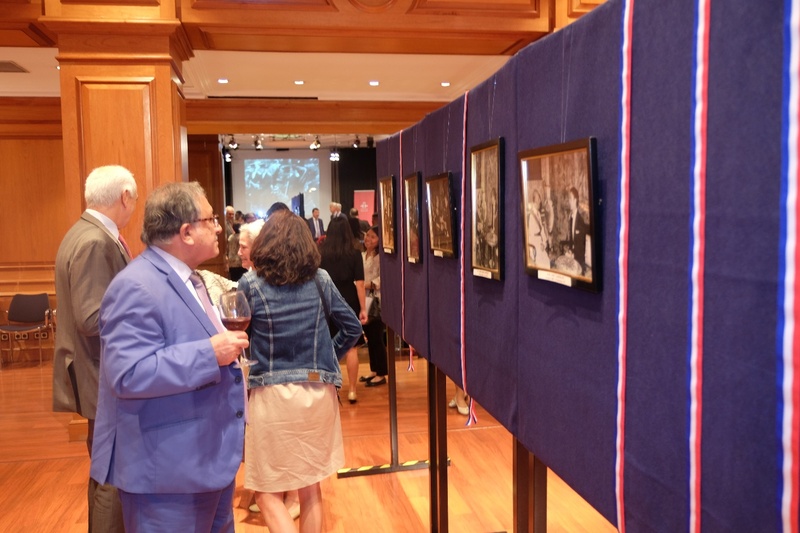 A mini-exhibit of former Philippine Ambassadors to Spain, during their presentation of credentials, was also held at the event. Figure 4. Around 100 guests from the diplomatic corps, Spanish government, academe, and business commemorated the event. 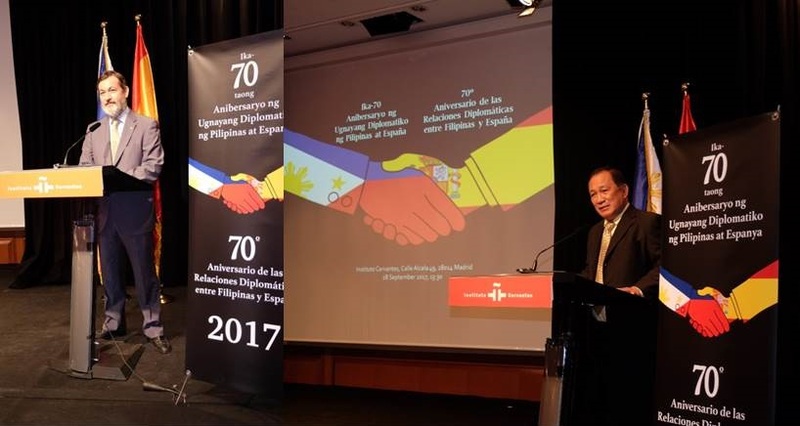 The Philippine Embassy in Spain commemorated the 70th Anniversary of the Establishment of Diplomatic Relations between the Philippines and Spain on 28 September 2017 at the Instituto Cervantes, Calle Alcala 49 in Madrid. Around 120 guests from the Spanish government, diplomatic corps, academe, and business sector were on hand to celebrate the event, which also featured a mini-exhibit of photos of former and current Philippine Ambassadors to Spain during their presentation of credentials to the Kings of Spain, and a replica of the treaty that formally established relations between the Philippines and Spain. 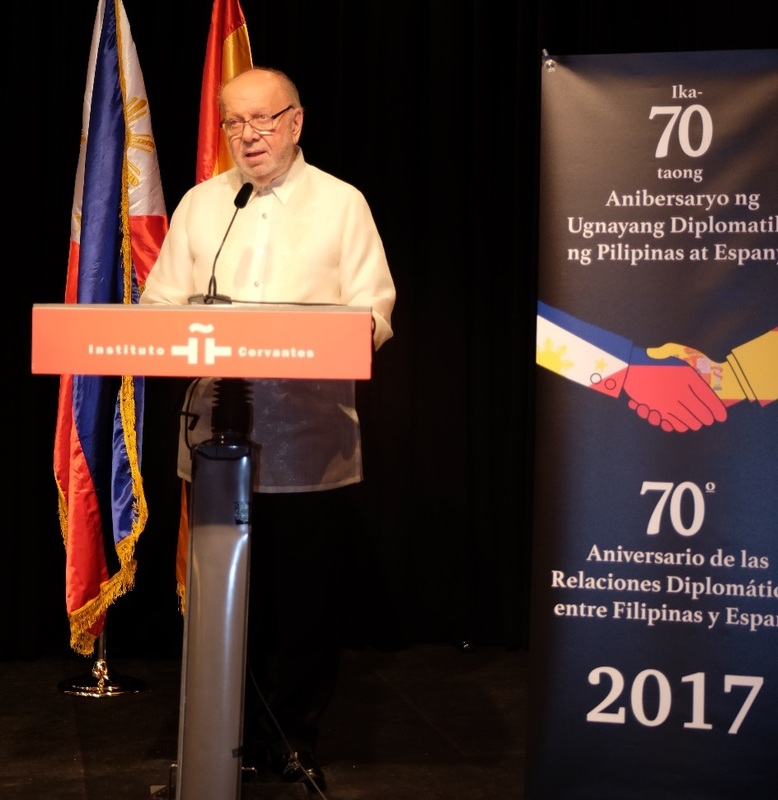 The Secretary-General of the Instituto Cervantes, Mr. Rafael Rodriguez-Ponga Salamanca, welcomed guests to the event and in his speech, emphasized the strong and enduring relations between the two countries. Rep. Benhur Salimbangon from the 4th District of Cebu, who was also a guest speaker at the event, stressed the close friendship between Spain and the Philippines and his desire for closer cooperation between the two countries. In his toast, Philippine Ambassador to Spain H.E. Philippe J. Lhuillier, underscored achievements in Philippine-Spanish relations including the consistent exchange of high-level visits and the signing of over 60 bilateral agreements in various fields. According to Ambassador Lhuillier, these agreements—on education and sports, cultural cooperation, tourism, technology, investments and other equally important areas—attest to the continuing effort by both countries to strengthen their relations through the years. The Ambassador cited the enactment of Republic Act No. 9187 in 2002, which made the 30th of June as “Philippine–Spanish Friendship Day”. The day commemorates the cultural and historical ties of friendship and cooperation between the two countries. It is a national special working holiday and a special non-working holiday in Aurora Province in the Philippines. 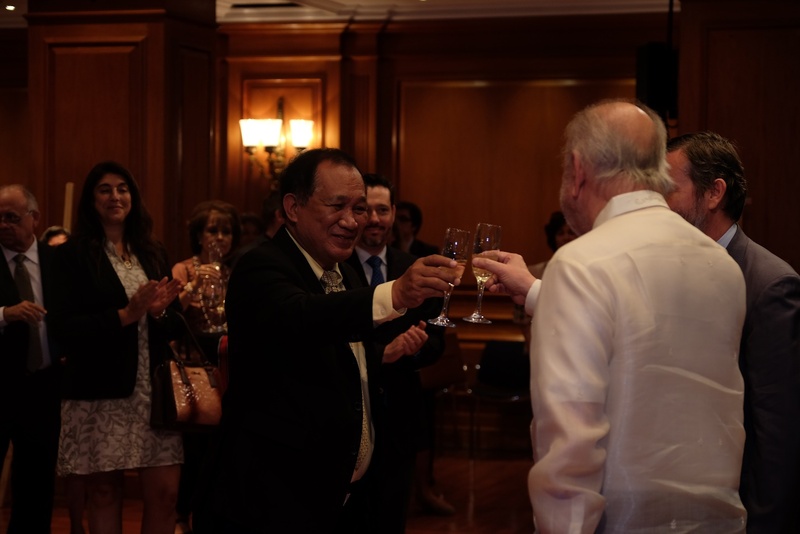 He further highlighted the emergence of Philippine investments in Spain, notably in wine manufacturing and real estate, and expressed optimism on the huge possibility of major Philippine brands coming into Spain in the next few years and Spanish investments and presence growing in the Philippines. Maximizing the potentials of existing mechanisms to boost Philippine-Spain trade and investments is also a key thrust of the Embassy in the coming years. 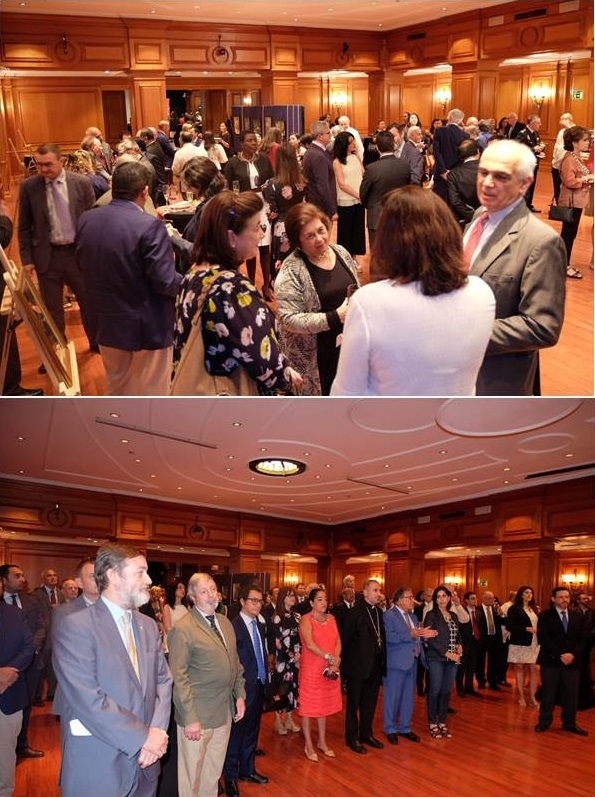 Ambassador Lhuillier also announced his plans for the Embassy under his tenure, foremost of which is the establishment of a Philippine Center that would serve as a one-stop shop for Filipinos working in Spain and Filipino-Spanish people who seek to reconnect with their heritage. He ended his remarks with a toast to the further strengthening of the excellent relations between the two countries. Formal diplomatic relations between the Philippines and Spain was established on 27 September 1947 and in March 1948, the Philippines sent Mr. Manuel Escudero to head the Philippine Legation in Spain as Minister Plenipotentiary. In April 1951, the Philippines sent former Supreme Court Chief Justice Manuel V. Moran as its first Ambassador Extraordinary and Plenipotentiary to the Kingdom of Spain. There have already been fifteen (15) Philippine Ambassadors to Spain, including the current Ambassador, H.E. Philippe J. Lhuillier.